Provides UNOFFICIAL updates for 50+ mods on a consolidated project page. All requests are being actively worked on! Additional contributions have been provided to project by VXWild, Syynx, killergas47, and Kevin843. 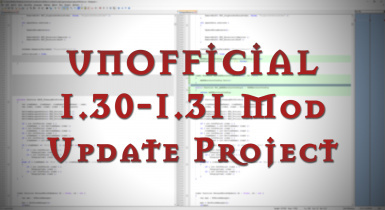 MOD AUTHORS: Please see 1.30-1.31 Script Comparison Resource for issues with your mods between 1.30 and 1.31 versions! PLEASE NOTE: I DO NOT TAKE CREDIT FOR ANY OF THESE MODS, ALL CREDITS SHOULD GO TO THE ORIGINAL AUTHORS! IF YOU USE ANY OF THESE, MAKE SURE TO ENDORSE THE MOD AUTHORS! The Enhancement System by Mangekyoumadara1987 (http://www.nexusmods.com/witcher3/mods/1112) - Make sure to follow every instruction on the mod's page -- this one is rather in-depth to install! Kill Count by alt4 (http://www.nexusmods.com/witcher3/mods/1707) - Fixed duplicate entry issue! TradeMan by GiecuMan (http://www.nexusmods.com/witcher3/mods/6) - Fixed buying/selling prices issue in this version. There is a known bug with the dismantle prices, this is an issue with TradeMan from 1.24. If I have time I'll try and fix it. Leveling Witcher and Relic gear BALANCED by katalysis (http://www.nexusmods.com/witcher3/mods/1732) Fixed all versions to work correctly (some items were leveling/not leveling incorrectly) -- make sure to get FIX2! No Combat or Weather Commentary by ralphonzolio (http://www.nexusmods.com/witcher3/mods/1426) - both versions updated! I've included scripts from 1.12, 1.21, 1.22, and 1.30 in the MISCELLANEOUS section (useful when updating scripts from previous versions). Shout out to wghost81 aka Wasteland Ghost, author of Friendly HUD (http://www.nexusmods.com/witcher3/mods/365) for providing these to the community first! Again, minimal testing has been done but they at least are all now compatible. Nothing has been changed to functionality. There was one or two scripts that I simply removed an extra line break or changed the indentation to play nicer with the script merger. Any of the mods covered that have special instructions for installing their menus, etc. must be followed. If my upload has a menu contained in it, that's just what came with their download. You're best double checking if they have any menu instructions or special things that need to be copied to a different directory. Only the scripts have been changed in my upload.